Classically Liberal: Return of the Mugwumps. You know Obama is in trouble when the Democrats can't hold on to Ted Kennedy's seat. Make no mistake about it, very few voters in Massachusetts voted for Scott Brown, the new Republican Senator. They voted against Obama, in particular they voted against his push to grab health care as a political prize for the party of government. I have long argued that the independent voters, those who think for themselves and aren't ruled by party loyalty, vote for the candidate they despise the least. Or they vote for the party they despise least. There used to be a coattails effect, where local candidates won office because the popularity of the leader of their party. That hasn't been true for a long time. Now we have the skunk effect. Candidates perceived to be close to the major politician who stinks the most, pick up his scent and voters reject him. For several years the biggest stench in Washington came from Dubya. The result was loss after loss for the Republicans. That meant wins for the Democrats. Stupidly the Democrats took that as a mandate to put the Bush big government programs on super-steroids. The Democrats very dumbly thought that people voted FOR them, instead of AGAINST Bush. This caused them to be ambitious as they really believed America had gone over for European style socialism. But they never had the support of the majority of voters, they just disgusted them less than Bush was doing at the time. Bush is gone, not in prison as one would hope, but at least gone. Dubya is no longer the big stench in DC. That honor goes to Obama, who has ambitions to remake America into something that the European Left would worship, much as they worship the man himself. Like all messiahs before him Obama is a fraud. And the independent voters turned on him very quickly. The independent voter is an interesting demographic. They tend to like lower taxes, tend to support freer markets, and don't seem obsessed by the moralistic rubbish that the Christians in the GOP love to salivate over. They seem vaguely libertarian in their sentiments. The Democrats would sell their grandmother to get state control of the economy, the Republicans would burn her at the stake in order to ram antiquated religious values down the throats of the public. Neither party is remotely close to holding libertarian values—even the Libertarian Party has trouble doing that, preferring to run two conservatives at the top of their ticket last time around. Unthinking parasitic Democrats are wedded to their party and won't budge. They want the right to pick the pockets of others. Unthinking theocratic Republicans are wedded to their party and want the right to plunge the country into some religiously-motivated revival of the Dark Ages. Independent voters are in the middle, not particularly thrilled by either set of choices. So they rock back and forth between the two parties depending on which party has repulsed them the least during that election. This happened once before in American politics. It was the 1880s and many Eastern liberals, that is liberal in the classical tradition, abandoned the Republican Party to elect Grover Cleveland, one of the least lethal men to occupy the White House. These men tended to me pro-free market and anti-imperialist. In fact many were involved in the Anti-Imperialist League of America at the time. Including in the Mugwump camp were old classical liberals like E.L. Godkin, William Graham Sumner, Moorefield Storey and Edward Atkinson. They were derided for supposed sitting on a fence, with their mug on one side and their wump on the other side—this to refer to the ease with which they could from Republican to Democrat and back again. 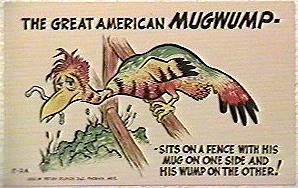 I always admired the Mugwumps. The Mugwumps were often involved with the struggle for equal rights for blacks, many were closely tied to the now unnecessary abolitionist movement to abolish slavery. For instance, Moorefield Storey, was a founded of the NAACP but a free market advocate. They embraced sound money, opposed US foreign interventionism, wanted small government and were not particularly inspired by some moralistic, religious agenda. In modern day terms they sound an awful like the "independent voter." The difference is that today's independent voters are even more Mugwumpish than the Mugwumps. They will turn on a party in the course of just one election cycle. Take independent voters in Virginia and New Jersey. In the last presidential election they were repulsed by Bush so they voted for Obama. But only last November both states elected Republicans as governor because the independent voters had already abandoned the Democrats. This is what we saw in Massachusetts. It was only more dramatic there because the seat had been Ted Kennedy's seat for some many years. When it became apparent that the vote in Massachusetts was going to be close, the Democrats pulled out all the stops. They even sent Obama into the state to push for their candidate, Martha Coakley. All they managed to do was grab the skunk from the White House and throw him into the arena with their Senatorial candidate. She was bad enough on her own, but was unelectable once she had been sprayed with the essence of the Obama skunk. Instead of shoring up Coakley's support Obama's presence reminded independents of precisely why they didn't want to vote for her. Republican Scott Brown, who is no gem I might point out, only increased his lead as a result. Polls show that independent voters simply are not positive toward either the Republicans or the Democrats, only 25% of them see one of the two major parties in a favorable light. Democrats are trying to remarket themselves by ignoring the take-over of health care and focusing on anti-business rhetoric—an area that is totally fraudulent with them as they are the worst corporatists around. Obama, who showered billions on big banks, went to Massachusetts and attacked Brown saying the "bankers" have enough votes in Washington. Obama should know, he's their number one supporter. Voters weren't buying it. And Obama's presence reminded them that they simply don't want a state take-over of health care. The result was that Ted Kennedy is now spinning furiously in his grave, which might explain the cold weather that has gripped the planet. The big mistake the Republicans will make is that they will crow that Brown's win is an endorsement for their big government programs, the same error the Democrats made when voters rebelled against the GOP for inflicting Bush on the country. The truth is that even the Washington Post found that 58% of voters want smaller government. And neither the Republicans nor the Democrats are offering that—they are too enamored with the power. The Mugwump is back and he's pissed. And I, for one, am happy to see it. posted by blog owner at 1/20/2010 04:51:00 AM DiggIt! Reddit Del.icio.us Slashdot It!